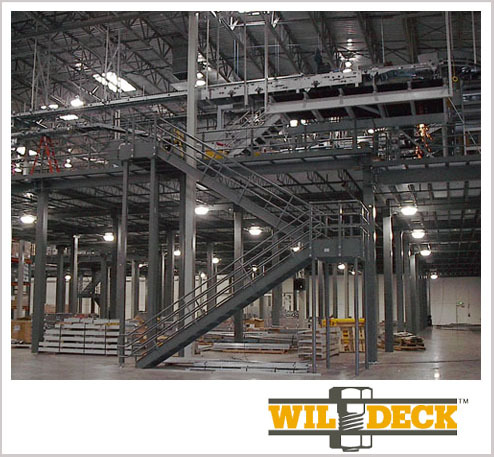 The addition of a single or multi-level mezzanine can double or triple your existing square footage. Yes, a mezzanine can create additional storage area, but a custom design from Morrison Company can also create new production and assembly areas, parts departments, stockrooms, office space, locker rooms, cafeterias, and the list goes on. Morrison Company’s long-standing partnership with WilDeck® means your new addition will be built using extraordinary products with proven strength and adaptability. The finished design will properly mix the products to maximize efficiency, achieve desired capacity, and satisfy optimum strength requirements. Rely on the experienced team at Morrison Company to deliver on quality, safety and cost-effectiveness.